Dentist in Istanbul > Blog > Dental FAQ's > Can an Implant be placed in every missing tooth? Not only would it be a very expensive option but it is also not feasible. If you imagine a peice of wood 4 inches long and you are trying to place 3 screws, each of them 1 inch in diameter. When the screws are in place the wood would start to split around the screws as they are too close together. The human jaw has 32 teeth (including the wisdom teeth) but the jaw bone is not able to hold 32 Dental Implants. Depending on how many teeth you have missing will depend on the number of Implants you will need. 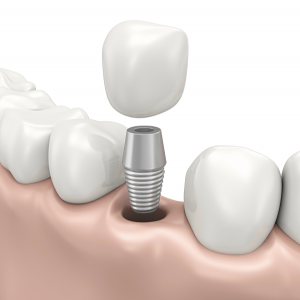 We do not replace every missing tooth with a Dental Implant. Generally If you have NO teeth on your upper and lower jaw we will place 12 Dental Implants (6 on the upper jaw and 6 on the lower jaw). The Implants are then used as Anchors for Dental Bridges which make a full set of teeth. The Implants ensure the Dental Bridges are strong and functional. If you are missing 4-5 teeth along the same row we generally place 2 Dental Implants that will securely hold a Dental Bridge to close the gap. Alternatively if you only have a one tooth gap, we place 1 Dental Implant and Single Implant Crown. A 3 tooth Dental Bridge is also an option in this case however by using an Implant to close the gap it ensures that your natural healthy teeth on each side of the gap are not damaged. Patients who use a Denture and have severe bone deficiency can have a Denture that is secured in place by 4 Dental Implants along the jaw line (2 at the front and 2 at the back on each side). This is also known as ‘All on 4’ and has helped many patients to have a functional aesthetic that enables them to chew foods and speak with comfort and without embarrassment. Every patient case is slightly different. If you are unsure about the number of Dental Implants you need please Contact Us for a no-obligation quotation.